I stumbled upon this post by Mo-ha-med and discovered a pretty good blog. I am reproducing the post in full. It’s about time someone put this much investigation into such a politically and economically critical yet entirely opaque issue. Don’t neglect to check out the first post (referenced in the first line) and the comments on it for some more valuable info. – Part One of this article presented a background to the Egypt-Israel gas export deal and what was ‘renegotiated’ last week, and can be found here. – The research here was all made from public sources. Some sources required a sign-up for a trial version. References from newspapers, business reviews and databases, and industry analysis consultancies are mentioned as often as humanly possible. Information from unreliable online sources, or quoting an inaccessible print source was discarded. EMG signed the gas export deal on the Egyptian side. But what hides behind this acronym? And why are they mandated with selling the country’s natural resources? EMG is short for ‘East Mediterranean Gas’ – an Egyptian-Israeli consortium. Which, despite managing multi-billion dollars projects, has no online presence or website. We do know however that it was originally a joint venture between the Egyptian Gas Petroleum Consortium (EGPC), a government joint venture operating under the ministry of Petroleum, and Israeli corporation Merhav, after a deal between Minister of Petroleum Sameh Fahmy and then minister of infrastructure Binyamin Ben Eliezer in 2005. The company has been quite keen on keeping a low profile – hell, I can understand them – but it has gone a bit too far: it is actually spreading false information about itself! But take a look at this page: this is a typical company-generated public profile – the only one I could find on the internet. – The website address is fictitious. That’s right: there is no www.emg.com. As a matter of fact, the domain name is registered for an education company in New Jersey. Right. 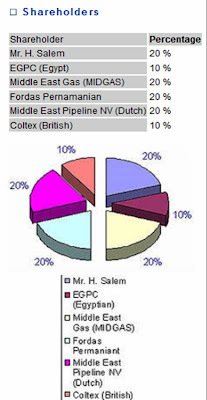 Only there is no “MIDGAS” that I can find, there is no Fordas Pernamanian, there is no Middle East Pipeline NV in the Netherlands, and there is no Coltex in Britain. There’s a Coltex in Austin, Texas, which generates annual sales of $170,000 so I’ll make the assumption that they’re not shareholders in a transnational pipeline. The profile makes no mention of business with Israel anywhere. It just says (hihihihihi) “… to Turkey, to other countries situated along the Eastern Coast of the Mediterranean”. Now to some more reliable information on the company. 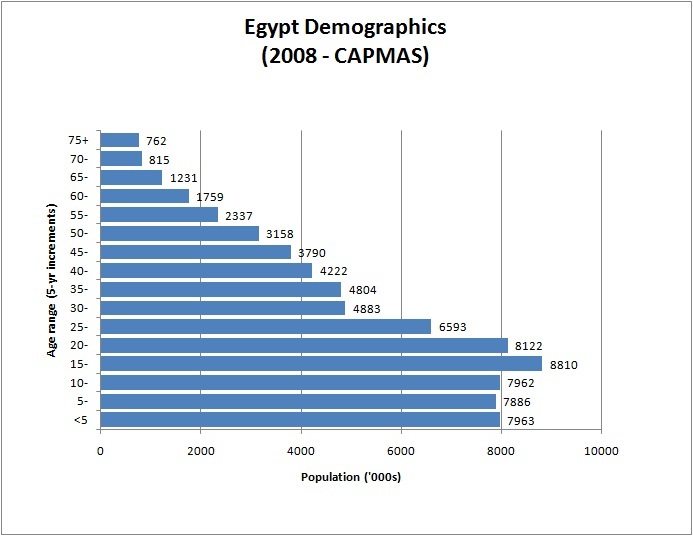 28% for HKS, the main Egyptian partner. They seemingly started off with 53% – a controlling share -but sold a 25% stake to PTT – before gas even started pumping. The main remark to make here is that — the Egyptian shareholders in the company that signed on behalf of the Egyptian partner own, that is commonly referred to as “Egypt’s EMG” hmmmm, a mere 38% of the capital. Let’s be very clear here: the Egyptian signatory to the deal is, ehhhh, not Egyptian. Beautiful, right? A little digging into the main partners in this venture is in order, surely. The State, of course. The Egyptian Natural Gas Holding company (EGAS) was established in August 2001 by Minister of Petroleum Sameh Fahmy (whose name pops up time and again in the EMG story). It “supervises the natural gas industry in Egypt, manages the foreign investments in exploration, production, and the usage of Liquefied Natural Gas tankers”. In 2000, the Egyptian government decided to allocate one third of the then proven reserves for domestic market requirements for 25 years, the second third for strategic purposes, and the remaining third, plus most gas discoveries from 2001 onward, for export.” Seems that EMG got some of those concessions..
Notice that when we read (like here or there) that “EMG reached an agreement with the Egyptian Government” – EGAS is the mandated government counterpart here. So EGAS reaches an agreement with a company it is itself a shareholder of. Does that sound like a conflict of interest to you? I guess we shouldn’t be surprised but can’t help to be a little bit – the 10 % share in EMG appears nowhere on the list of EGAS affiliate companies. The Egyptian government is a silent partner. Hilarious. Though not unforeseen, given the expected unpopularity of the deal. The HKS-Group is named after the initials of its founder’s, Hussein Kamal-el-Din Salem (usually just referred to Hussein Salem). A real-estate development company, it owns a number of hotels, most notably the Jolie Ville hotels franchise it took over in 1997. Hotels aside, HKS is no stranger to energy mega-projects. In 1993, it established the ‘Middle East Oil refinery’ (MIDOR – Remember that name!) but declared it pulled out of project (apparently in 1999?) to, I quote, “concentrate in (sic) other new ventures and projects… on the core business of Hospitality and tourism”. Yet it still owns the Midor Electricity Company (MIDELEC), which provides electricity to 3 oil refineries in the Alexandria region, chiefly to… MIDOR. (Which HKS says it pulled out from). Interestingly enough, MIDELEC is no longer mentioned on the company’s main website – but it seems they may forgotten to remove it from the company profile page on the Jolie Ville website. MIDOR itself is a fascinating story. And it was most probably the meeting point for many partners of the EMG adventure. For instance, guess who was made CEO and Vice-chairman of MIDOR in 1997? Sameh Fahmy, who 2 years later became minister of Petroleum, apparently supported by a recommendation of Mr. Hussein Salem to the President. Briefly thereafter, a spinoff of HKS’ MIDOR was established in 2000, Al-Sharq Gas Co., selling gas to Jordan and Syria via the ‘Arab Gas Pipeline’. Al-Sharq, along with a handful others JVs, was granted particular advantages, namely “the same incentives and profit splits as foreign firms”. And guess what Israeli company was part of the MIDOR joint venture? Merhav. They eventually withdrew – APS Review suggested that Gulf countries wouldn’t supply the refinery, forcing it to buy on the spot market; the Ahram Weekly put forth similar justifications at the time. Other explanations include the more general deteriorating Egypt-Israeli relations with Likud’s accession to power in 2001 – but I’m not too inclined to buy this justification. Its Chairman and CEO is a gentleman named Medhat Youssef Mahmoud; until 2006 though it was still reported that Hussein Salem, who held on to 2% of the shares, held the post. HKS seems to have botched attempts to distance itself from the MIDOR sour memory, and to pass EMG for something it is not. At some level, their behaviour seems so nonchalant I wonder if they really meant to try to put this distance. 3. And the main Israeli partner, Yosef (Joseph / Josef / Yossi) Maiman? He’s not this the guy on classmates.com :). German-born, Peru-raised Maiman is a wealthy and influential Israeli businessman who owns Merhav (since 1972), is President and CEO of business conglomerate Ampal, and is on the board of Israel’s Channel 10. (see here, or here if you like US Government archive documents!). and, random fact of the day, his 2007 compensation was $2,154,563. Not bad! With business interests around the globe, including several very large energy projects in the Middle East and Central Asia – with so much political influence there it reportedly worries Iran. He was also involved in a messy gas concession debacle off the Gaza coast with British Gas and the Quartet Representative a couple of years ago. He’s a former intelligence officer (yes, former Mossad, but don’t freak out :), hence the close relationship with Shabtai Shavit, whom he recruited to head EMG’s Israel office. (Yes. The Israel office of “Egypt’s” EMG is headed by the former Director of the Mossad. Tadaaa!). Oh, and apparently Maiman is such good buddies with President Shimon Peres, he reportedly hosted his 80th birthday party in uber-posh neighbourhood Herzliya Pituah. Selfless friendship, clearly. His Egypt connections go via HKS (MIDOR, of course) but also apparently via a longer chain of Maiman –>Shavit –> Omar Suleiman –> Every Egyptian Government big head. This relationship, Haaretz suggests, helped him get the EMG deal. The Egypt-Israel gas deal, it turns out, is a barely concealed cesspool of clientelism, personal relationships and private interests, breaches of government procedure, of transparency rules, and of corporate governance. And we’re wondering why the deal was originally underpriced? I’m surprised we knew anything about it in the first place. This is pretty much what i was implying earlier. With the attention of a great power like the United States, and a regional power like Venezuela, Brazil finds itself in a position of power that gives it several opportunities. Whether or not the Brazilian government headed by President Lula Ignacio da Silva will choose a path of unilateral action and stay completely unaffected by the two interceding powers or cooperate with the two powers vying for its attention is yet to be seen, but it is critical to recognize that Brazil will determine its own actions and that it is a strong enough power to hold all the cards in the current situation.